I’ve been knitting away on two projects recently. I’ve found a system that I can only implement here, in my parents’ big house. My newest project (cast on as soon as the Annetrelacs were done) are my Druid mittens, and they are my basement project. The long-neglected $1.50 cardigan is my upstairs project. The mittens get worked on when I go down to the basement to watch TV after dinner. The having cable thing is great; I get to watch Iron Chef, and Mythbusters (I would love to work with Jamie and Adam)! On a side note, these Discovery Channel ads doesn’t get old. 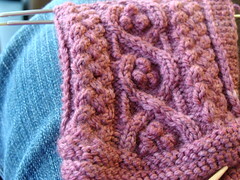 The cardigan gets worked on when I curl up in the chair in my bedroom and listen to podcasts, or watch things on my computer (like…. all of Heroes Season 2). 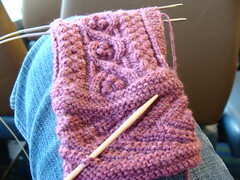 The mittens are fairly slow going, what with all the cabling. I’m using 2mm needles, and the fabric is quite tight, but that’s good in mittens because it will keep the wind out. What I’m finding interesting is that I seem to have a different row gauge on the back of the mitten than I do on the palm. The back of the hand is all cable-y, and the palm is a slip-stitch pattern, and somehow I am much tighter doing the palm pattern. It is actually causing the mitten to want to curve over. Luckily, that’s the shape hands naturally are, so hopefully it won’t affect the finished product too much. I took these photos on the ferry. I had to get away from the house for a day or two, so I went to Vancouver and visited some friends. 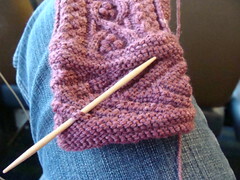 Waiting for the ferry, and being on the ferry gave me lots of knitting and reading time. This entry was posted in Hand Warmers, Knitting, Sweaters and tagged dollar and a half, druid mittens by rycrafty. Bookmark the permalink.